Join us for our final event in this year’s calendar. We’ve teamed up with some of our members to offer you our Santa’s Workshop experience at Oakwood Cookery School. With canapes and bubbles on arrival and an opportunity to purchase some Christmas gifts, you’ll be releasing your inner elf with the experiences we have on offer. Christmas Scones – Get your hands stuck in to some festive baking with Moray’s award-winning cookery school. Learn the basics and watch your festive flavoured scones rise to the occasion! 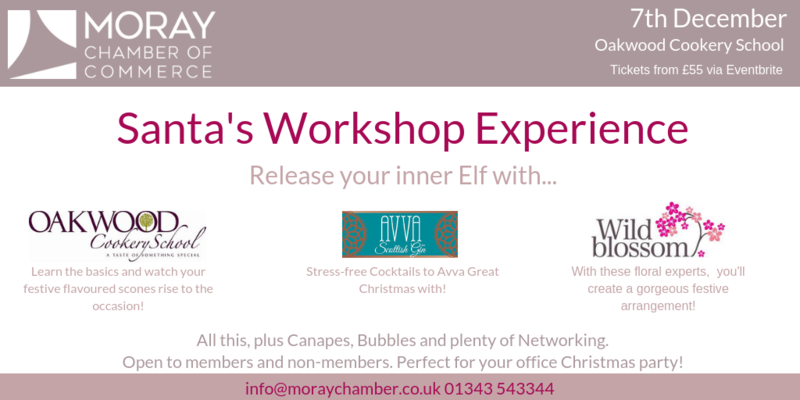 Stress-free Cocktails to Avva Great Xmas with – Come join us for some easy to shake up cocktails with a culinary twist. Included in class will be ingredients to shake at home whilst enjoying a drink or two during our demo. Floral table decoration – With floral experts, Wild Blossom, you’ll create a gorgeous festive arrangement, using birch containers, perfect for your home or as a gift. You will use winter foliage, spruce, pine, seasonal flowers, berries and textural elements such as cones, fruits and seed heads plus candles if you wish. Each workshop is 30 minutes each and there will be time for you to enjoy your produce or to take them away. We will also have a Clarins expert on hand from Moray’s only Clarins Gold Appointed Salon, Beauty at Bijou, and there will be a range of gift boxes for you to browse. So, come along to meet some new faces, bring some colleagues as a work night out or even bring a friend. We look forward to welcoming you all. Tickets for members are £55 + VAT and booking fee or three for £150 + VAT and booking fee. Numbers are limited and are sold via Eventbrite on a first come, first serve basis. Tickets are available to non-members at £65 + VAT.